Indoor play areas like Pump It Up and Pickle's can be great opportunities to allow your child to socialize with other kids and maybe even give you a bit of a break (or some adult conversation). Kids can run around, jump and just have fun, giving them a chance to spend some time keeping healthy and burning energy. 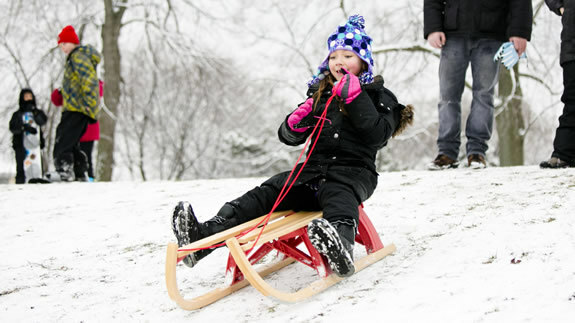 If the snow is right, Chicago-area parks have some great sledding hills. It will provide your family a chance to play in the snow and catch some downhill speed. Chicago is known for its incredible museums. From small niche-based museums to the larger, world-class locales, there is something for children at all of them. If you have fun and think you’ll go often, many museums allow you to purchase a membership after your visit and reimburse that day's admittance (and also grant you FREE parking)! Check you and your child into an indoor pool. Swimming is often so linked to summer that a dip in the pool is a great way to forget the cold. Chicago Park Districts and many gyms have pools that you can access during the winter months. Your child may hate shopping, but she probably doesn't hate the play areas at malls. Most Chicago malls have fun activities for kids, from carousels to basic play spaces. Many are also located near movie theaters for a family-friendly film as a special treat. Set up some friendly competition during a play date with safe, easy challenges. Increase the fun and spirit with special awards or medals for winning. You can even integrate some activities where parents compete with the children. Children 2-14 love blanket fort building. While you can purchase a building set, you can still setup chairs between walls, sofas or other obstacles to build your fort. Don’t forget the tasty snacks and flashlights! Children love a challenge. Set up an obstacle course around your house and see if your children can complete the task. Allow your child to add new challenges or setup a time trial. This can be especially beneficial for children in OT. Not all board games are equal. Everyone has their favorite and their own set of rules. Add a few fun twists to your normal game for more interesting outcomes or opportunities. You can even add some physical challenges to your board game to make it more interactive. This may sound messy, but make it indoor-friendly with loofas and music—freeze when the music stops and resume when it continues. Count your hits or just have fun. Add some strategy to it with a capture the flag between blanket forts or pillow shields.